RIO DE JANEIRO, BRAZIL – Featuring ninety pieces of Greco-Roman archeology from South America, a new temporary exhibition will open to the public on April 1st in the Museu Nacional (National Museum). The Teresa Cristina: A Imperatriz Arqueóloga (Teresa Cristina: The Empress Archaeologist) exhibition will remain on display through September. 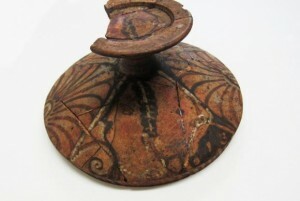 Piece featured in the Teresa Cristina: A Imperatriz Arqueóloga exhibition, photo from Silvia Reis/Museu Nacional/Press Image. Part of a larger permanent collection, the new exhibition features never-before-seen pieces from the collection of the wife of the second and final Emperor of Brazil Dom Pedro II, Empress Teresa Cristina Maria de Bourbon, better known as Teresa Cristina. Teresa Cristina is considered to be responsible for the museum’s permanent Classical Archaeology collection, which consists of approximately seven hundred objects. Located in Quinta da Boa Vista in the Rio de Janeiro Zona Norte (North Zone) neighborhood of São Cristóvão, the Museu Nacional was formerly the Imperial Palace. It was home to the Portuguese Royal Family from 1816 and 1821. The Museu Nacional, founded by King John VI of Portugal in 1818, was moved to the Imperial Palace in 1892. The museum is now home to the largest collection of natural history and anthropology pieces in Latin America and in addition to Archaeology collections features both permanent and temporary Geology, Paleontology, Natural History, Ethnology and Anthropology exhibitions. When: April 1st – September. Tuesdays through Sundays 10AM – 5PM and Mondays 12PM – 5PM.